Congratulations! You’re a “one-percenter,” a member of the richest one percent in annual income. This may come as a shock when you look at your tax return. But I’ll wager a large amount it’s true. What’s more, this fabulous wealth of yours is almost entirely due to the catallaxy. Aristotle was the first person to define the word economy. He called it “the art of household management.” But he used it to describe the management of an entire city-state. Yet our nation-state is no model of fiscal responsibility. When Barack Obama took office, the national debt was already an impressive $10 trillion. Today it is $18.1 trillion. And while the annual deficit has fallen over the last four years, the national debt is still growing at a rate of more than $50 million an hour. In the public sector, the red ink keeps rising. In the private sector, however, the black ink does. U.S. corporations are sitting on record amounts of cash, more than $2 trillion. Corporate profits are at an all-time high. So are profit margins. And share prices. Americans themselves have never been richer. According to the Federal Reserve, U.S. household net worth hit an all-time record high of more than $81 trillion last year. The gains have not been spread evenly, however. The rich are getting richer much faster than the poor or middle class, a trend that has been going on for decades now. The Federal Reserve’s zero interest-rate policy, which punishes savers and rewards risk takers. Just how rich are the top 1%? 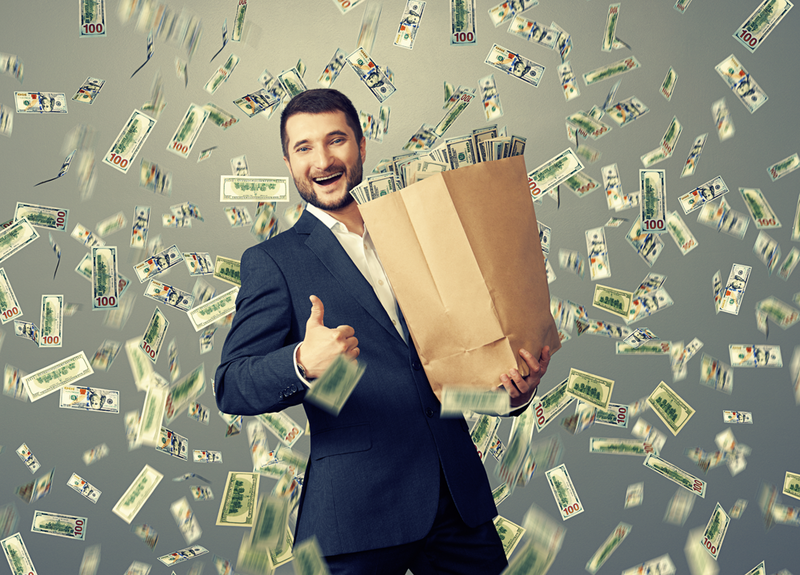 According to the most recent numbers from the IRS, you need at least $389,000 of adjusted gross income to be in the top percentile of U.S. income earners. Seeing this figure, you might refer back to my earlier wager that you are a one-percenter and cry “Pay Up!” or “Balderdash!” Or perhaps something stronger. I don’t claim that you are one of the richest 1% in the United States, however. My bet is that you are one of the richest 1% on earth. According to the World Bank, you need an annual income of just $34,000 to be among the richest individuals in the world. Given that you are reading an investment column, I strongly suspect that you are a global one-percenter. Those of us in the West are far wealthier than the average inhabitant of this planet. Yet democracy, technology and free markets are creating a rising tide of prosperity. It’s all due to the catallaxy, a term coined by Austrian economist Ludwig von Mises and popularized by his acolyte, the Nobel Prize-winner Friedrich Hayek. Hayek used it to describe the spontaneous order created by exchange and specialization, something we tend to take for granted. Think about it. Do you manufacture or service your own car, produce your own energy, build your own home, provide your own utilities, grow your own food, perform your own healthcare services, make your own clothes, engineer your own phone, or program your own computer? Do You Have $25,000 or More in a Retirement Account? You're likely getting shortchanged with your current IRA or 401(k). Most Americans report annual portfolio returns maxing out at 5% to 12%. But thanks to a new kind of retirement plan, over time you could see jaw-dropping returns up to 6 to 21 times higher than most investors... no options involved. Find out how right here. Who organizes the billions of people - who don’t know and might not even like each other - to make the trillions of decisions necessary to bring you the countless goods and services you depend on each day? No one does. No one could. It’s all the result of the catallaxy, the spontaneous order created when people everywhere act for the simplest and most durable of motives: rational self-interest. Rest assured, we are still in the early stages of global wealth creation. As technology and capital spread around the world, free markets raise billions out of poverty. Billions more will join the middle class. And many millions will get rich. Today we are more connected than ever. People around the world - even the poorest - are sharing their thoughts on Twitter, their photographs on Flickr, their knowledge on Wikipedia, their friends on Facebook, their software patches on Linux, their community news on Craigslist, even their medical records on PatientsLikeMe. All are giving according to their abilities to those according to their needs to a degree Karl Marx could never have imagined. As human exchange and specialization thrive, the world gets richer. You will too. After all, you’re already a one-percenter. As the catallaxy expands, knowledge increases, prosperity spreads, poverty declines, technology progresses, freedom increases, violence abates and human beings flourish. Best of all, the catallaxy creates wealth faster than governments can squander it, even one as profligate and dysfunctional as our own. Moreover, diminishing poverty and rising prosperity are creating a new golden age for investors. It’s a big story, one with endless ramifications... and plenty of debate. That’s why we’ve made that debate the theme for our upcoming Investment U conference at the beautiful Renaissance Vinoy Resort in St. Petersburg, Florida, March 11-14. You’ll be hearing a lot more about it. I hope to see you there. For more information, visit http://investmentuconference.com. Do you agree with Alex? Let us know in the comments below. While a fast-growing adult population is widening the global wealth gap, it is good news for one sector: retirement homes. Senior care is one of the great growth opportunities of the near future. According to the U.S. Census Bureau, men and women age 75 and over will represent 12% of the population within 15 years. One company poised to profit from this trend is Brookdale Senior Living (NYSE: BKD). It’s the largest operator of independent living communities in the U.S., with more than 600 facilities. Around 80% of its revenue is paid for by residents or their families (vs. Medicare or private insurance). So that makes it relatively insulated against policy changes in federal reimbursement programs. And with 40 million Americans about to hit retirement age, this company - and its shareholders - are in for explosive growth in the years ahead.